Eureka High School’s football team waltzed through the Class 1A East League schedule at 5-0, allowing just 56 points. Carl Paice/Special to the Times-Bonanza Senior Brandon Scobee breaks a tackle by Eureka freshman Clayton Shoda on Saturday in the Class 1A state semifinals in Ely. 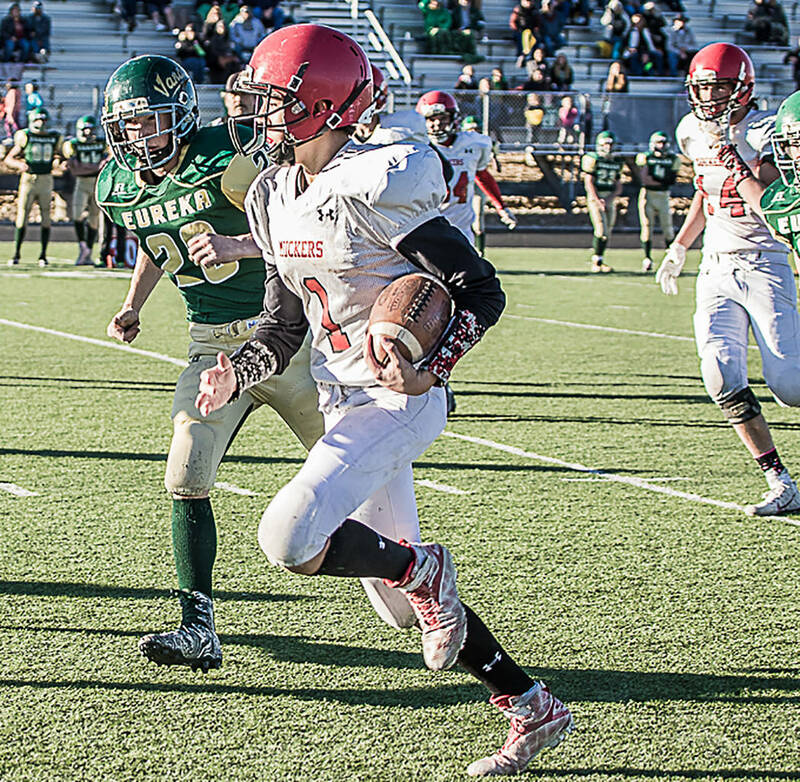 Scobee rushed for 112 yards in Tonopah's 68-20 victory over the Vandals. Carl Paice/Special to the Times-Bonanza Junior quarterback Dillan Otteson scrambles 14 yards for a first down on fourth-and-6 during Tonopah's final possession in a 68-20 rout of Eureka in the Class 1A state semifinals on Saturday in Ely. 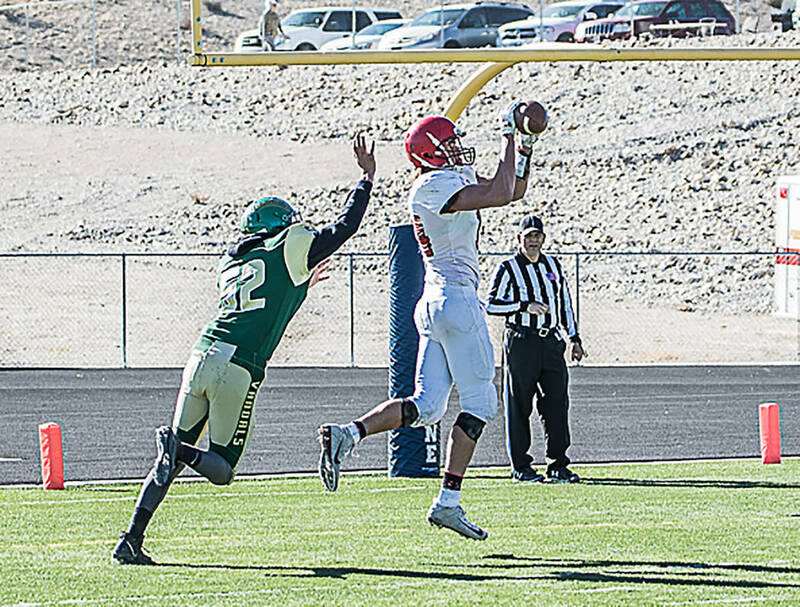 Carl Paice/Special to the Times-Bonanza Senior Kevin Pope catches a 2-point conversion pass from Dillan Otteson for Tonopah's final points in a 68-20 win over Eureka on Saturday in the Class 1A state semifinals in Ely. Carl Paice/Special to the Times-Bonanza Tonopah junior Kobe Bunker scores one of his four touchdowns during the Muckers' 68-20 win over Eureka on Saturday in the Class 1A state semifinals at White Pine High School in Ely. 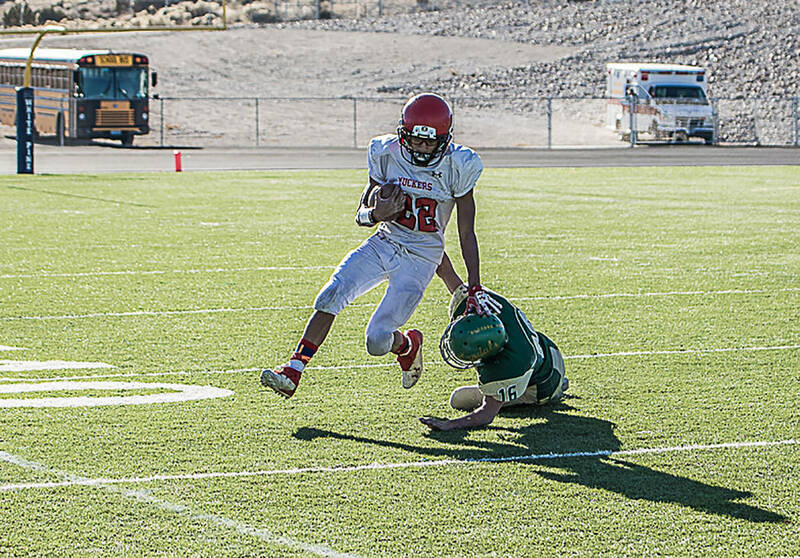 On Saturday, Tonopah topped that in less than three quarters. Junior Kobe Bunker caught seven passes for 167 yards and four touchdowns and rushed seven times for 141 yards and a score as the Muckers (11-0) dominated the Vandals 68-20 in the Class 1A state semifinals at White Pine High School in Ely. If there was an emotional letdown after the opening-round win over defending state champion Pahranagat Valley, it didn’t show, at least not on Saturday. “Our practices weren’t too good last week,” Bunker admitted. It looked as if the Vandals could give the Muckers a decent battle, at least early. They drove 59 yards on their second possession only to be stopped cold on fourth-and-goal from the Tonopah 1 after they had a first down at the 5. They then scored on back-to-back possessions early in the second quarter. By that time the Muckers already had 24 points, mostly thanks to big plays. Senior Brandon Scobee, who finished with 112 yards rushing, scored on a 65-yard run before Bunker scored on a 68-yard run and set up a Dillan Otteson 8-yard keeper for a score with a 42-yard run. “We could tell that they were good, but we just did what we always do,” Bunker said. But the Vandals were hanging around, and if sophomore quarterback Wyatt Anderson was a bit more accurate, there could have been trouble. 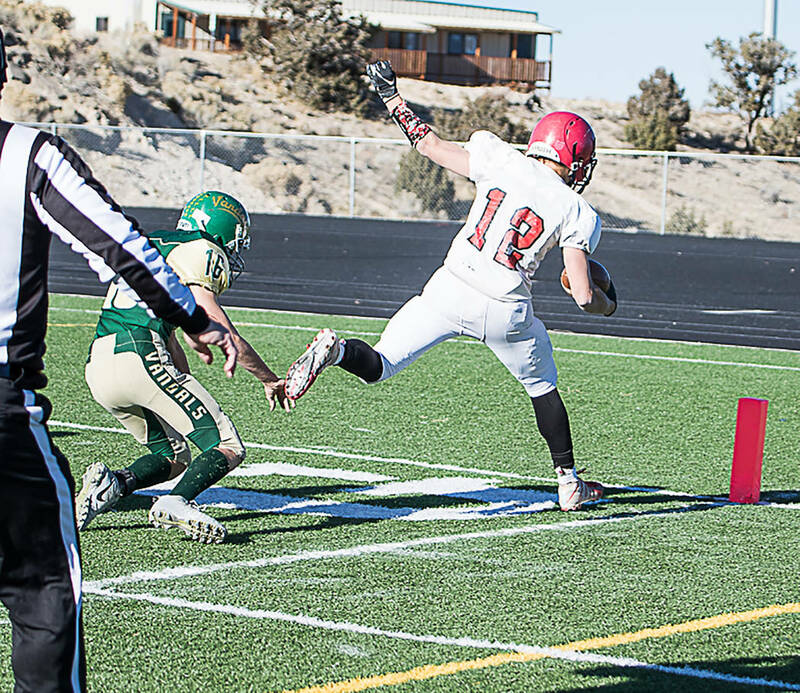 Anderson overthrew open receivers several times, causing Tonopah to make a change. It made a difference. Anderson was 5 of 8 for 93 yards midway through Eureka’s second scoring drive but finished with nine consecutive incomplete passes. The Muckers also sacked him five times, two by senior Brishon Skiles and one apiece by Pope, Matthew Melendrez and Max Swanson. “We do what’s needed to help us out,” Duffy Otteson said. “As far as pressure, yes, we made the adjustment but also fixed the receiver running free, and causing him to throw under pressure caused bad passes and sacks. Outside of the second quarter, our defense played great and made the adjustment to be successful. Meanwhile, the only thing slowing down the Muckers was, well, the Muckers. And that didn’t happen much. The Muckers committed nine penalties for 85 yards and had three turnovers, one a fumble in garbage time with a running clock, but their quick-strike offense negated any small bit of momentum the Vandals could muster. Trailing 38-14 to start the second half, Eureka showed no quit. On fourth-and-1, senior Garrett Todd ran toward the right side of the line, disappeared into a pack, then emerged with a quick burst that carried him 40 yards for a touchdown. That pulled the Vandals within 38-20. It was the last time they would score. Tonopah immediately worked to put away the game. On the ensuing possession, the Muckers needed four plays to go 80 yards, with Otteson finding Pope open deep down the left side for a 69-yard score, with Bunker providing a downfield block. “Last year we weren’t too good, but this year we all came together, and everyone wants everyone else to block how they would block for them if they were running,” Pope added. The only thing left to do was add plays to the highlight reel, which Bunker did, taking a pass from Otteson in the flat, dancing around a would-be tackler and scampering 69 yards for a touchdown. Bunker also scored the Muckers’ final touchdown on a 22-yard pass from Otteson. Otteson didn’t look his best after a shoulder stinger on the first play of the game, but he still completed 15 of 29 passes for 302 yards and five touchdowns with two interceptions, ran for 64 yards and a score and recorded a team-leading nine tackles. The Muckers racked up 619 yards of offense while holding the Vandals to 239, much of it after the outcome was no longer in doubt. Even then, the Vandals suffered a final indignity. After a fumble, the Vandals took over on their own 43 with 3:15 to go with a running clock. Backup quarterback Clayton Shoda completed two passes for 33 yards trying for one last score, but he was forced to scramble on the game’s final play, coming up 1 yard short of the end zone. “At the beginning of the season I did not expect us to get this far, but then after like the fifth game, I knew it was going to keep going,” Bunker said. It will keep going all the way to Beatty, which will host the Class 1A state final at 1 p.m. Saturday when Tonopah faces Spring Mountain (9-1), a 41-24 winner over Virginia City in the other semifinal. The Golden Eagles have won nine straight games and have scored 583 points in 10 games while posting five shutouts. “We’re ready for whatever,” Pope said. Passing: Tonopah — Otteson 15-29-2-302; Eureka — Anderson 5-17-1-93, Shoda 2-4-33. Rushing: Tonopah — Bunker 7-141, Scobee 11-112, Otteson 8-64; Eureka — Todd 9-93, Hayward 5-25, Shoda 1-16, Lee 12-16, Anderson 7-minus-37. Receiving: Tonopah — Pope 5-113, Bunker 7-107, Katzenbach 3-24, Scobee 1-3; Eureka — Drayton 4-87, Shoda 1-24, Todd, 1-13, Hayward 1-12.